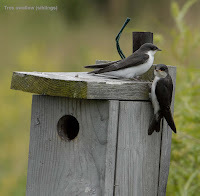 Tree swallow nesting boxes placed in the park to date have been very successful and are a big draw for park visitors. Unfortunately, there are always more potential tenants than nesting boxes and in a couple of weeks the annual struggle for occupancy will start all over again. 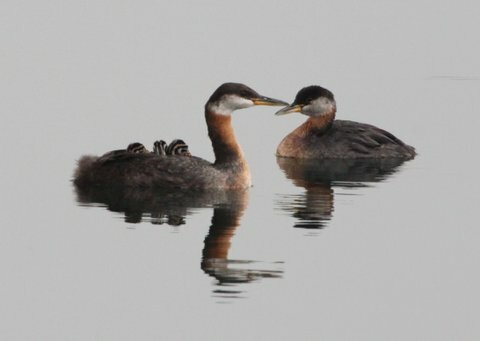 It would be a great idea if FOSS members could increase the nesting capacity for these delightful birds by putting additional, simple-to-make boxes on stakes that are already in the park. Along the shore on third bay (east side) are a number of metal stakes that are ideal for this - see photo. Boxes are easily made from a 6' X 6" X 1" pressure treated board ($3 at Home Depot) and construction plans are available at http://www.coveside.biz/tree-swallow-house-plans.htm The clean-out side panel should be secured with a small screw to deter vandalism. Boxes should be placed facing any direction other than north and at about five feet. This would make a great school or interest project to do with your kids. If they were set up in the next few weeks, they would probably be occupied this year. If you need any help with this or want to discuss it, please contact Terry Smith at tz.smith@sympatico.ca. Alan Valk built and installed four boxes in this area and they are already being claimed. Check them out on third bay. Are these approved and permitted by the City?